In a small bowl, add sea salt, pepper, garlic powder, smoked paprika, and rosemary. Mix to combine. Rub dry rub all over pork loin and place in a crock pot. Cook pork loin on HIGH for 6 hours. Using two forks begin to shred pork in crock pot until there are no more chunks, toss shredded pork around in the sauce. 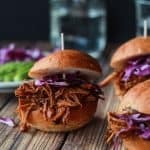 Serve on top of whole wheat sliders with fresh purple cabbage and avocado slices.